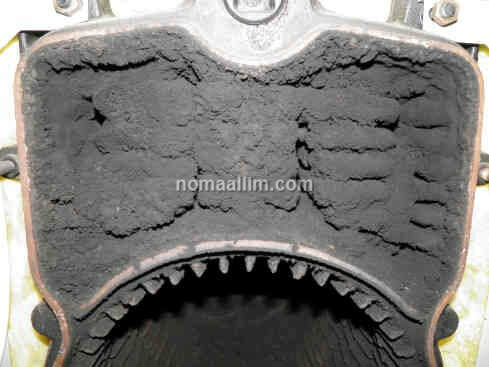 It is obvious that such works are to be carried out on a cold boiler. 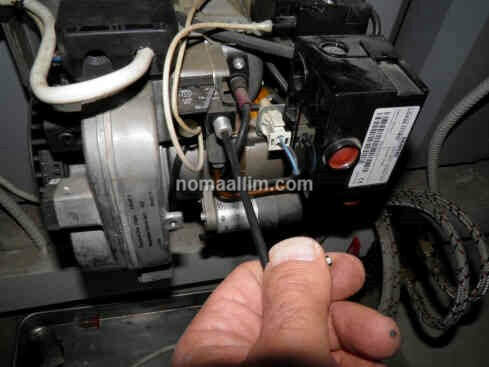 Make sure to isolate the electrical circuit feeding the boiler. 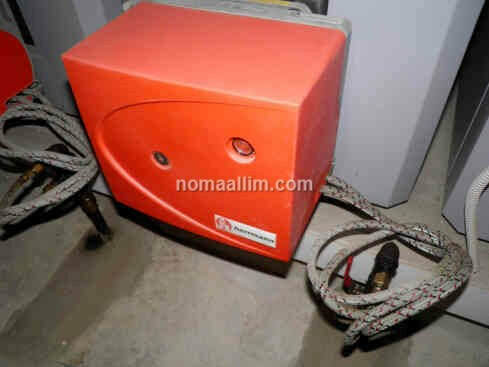 You should not proceed by simply shutting it off with the switch or thermostat but rather isolate its breaker. 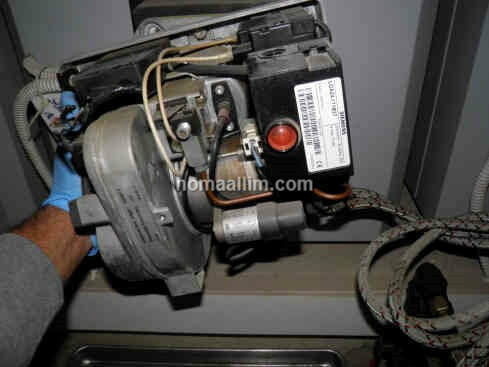 This domestic boiler was left without maintenance for 4 years. 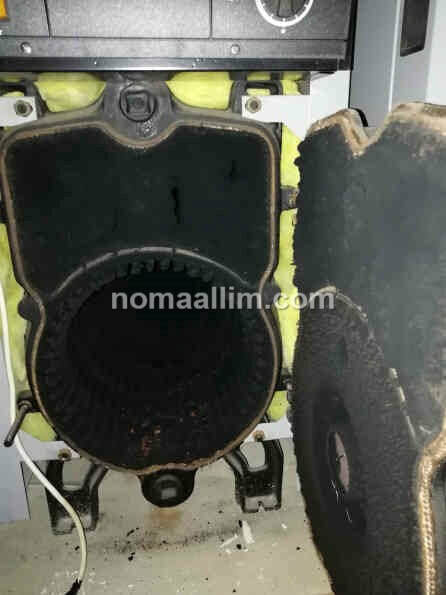 Its outgoing steel pipe connection to the main chimney got partially obstructed causing back pressure in the main chamber and restricting the flue gas (fumes) flow which resulted in a black soot covering the entire boiler chamber, the fume passages, the door, etc. 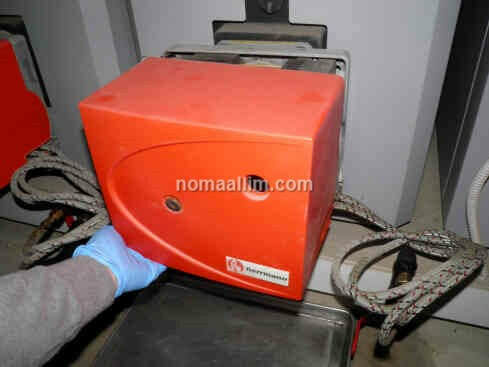 The cleaning process is not described in this page. 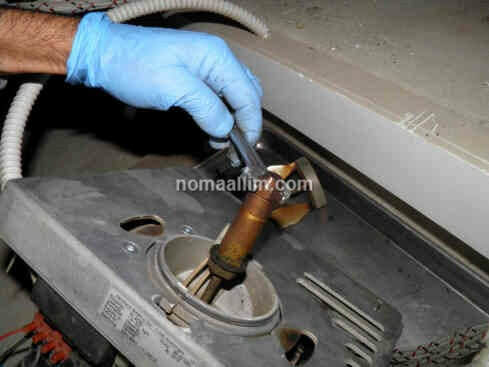 Click here to visit our detailed boiler cleaning pictorial. 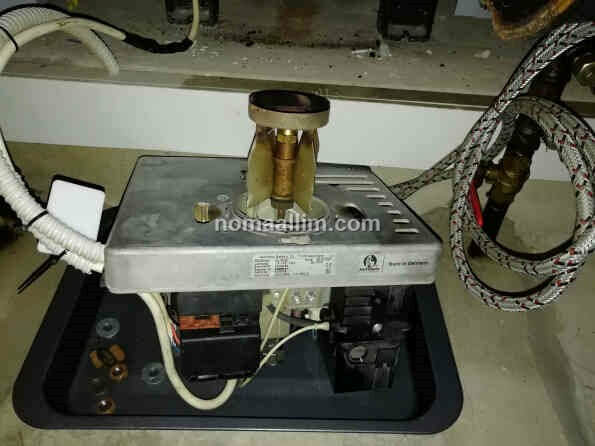 In general, you need to place a metal tray beneath the boiler chamber then take out the black soot with a metal or nylon cylindrical brush. 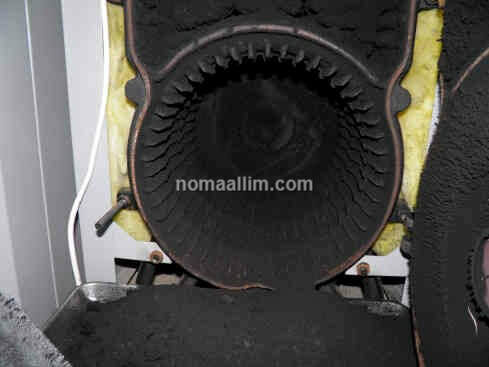 The use of a barrel vacuum cleaner is highly recommended to complete the job and for reaching the boiler outgoing pipe from within the fume passages fins. 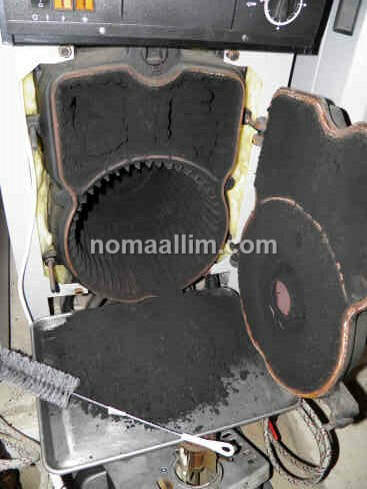 The picture to the left shows the enormous quantity of black soot that has been extracted from the boiler chamber. 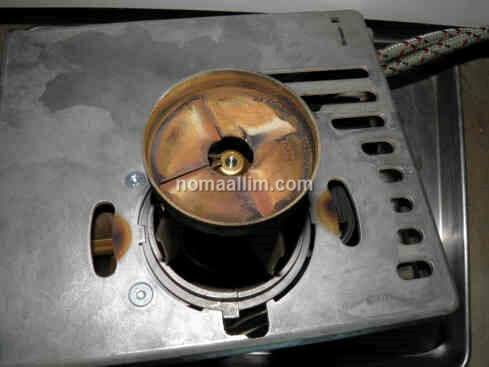 Prepare large trash bags and replace the bag of your vacuum cleaner prior to proceeding with this intervention. 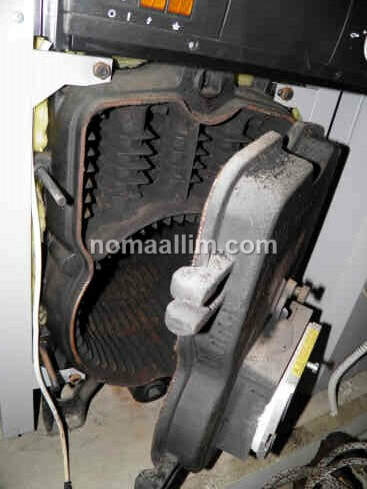 The picture to the right shows how the boiler fins are made visible again after a first round of cleaning. 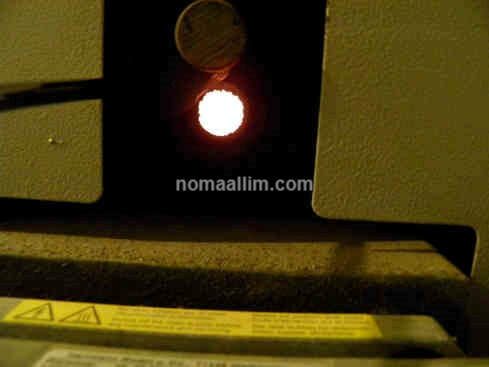 Red solid particles are visible in the main chamber signaling the presence of sulfur in the gas-oil. 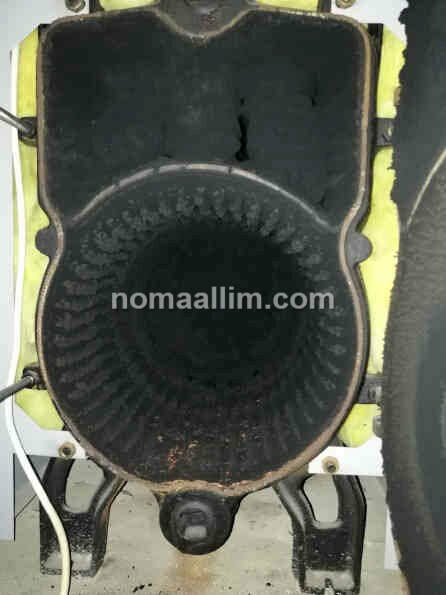 Some burners can be separated from the boiler without the need to remove the cover; others like this ones require the cover to be removed first. 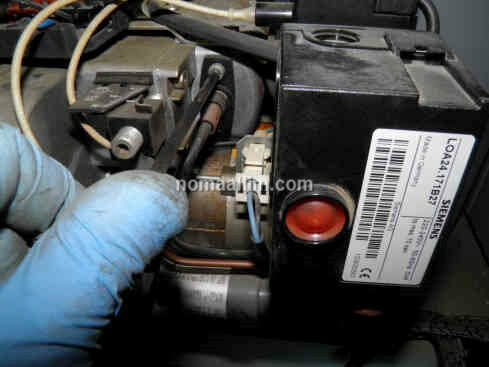 The burner is held with a single bolt which has to be loosened (middle) before tilting the burner counter clockwise and pulling it out. Put it in a metal tray. Depending on the burner head assembly, it might be required to take out the electrodes to access the jet. 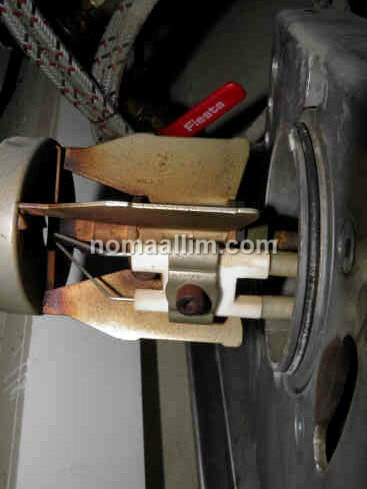 Loosen the bolt that holds the burner air guide to the burner head and pull out the air guide. 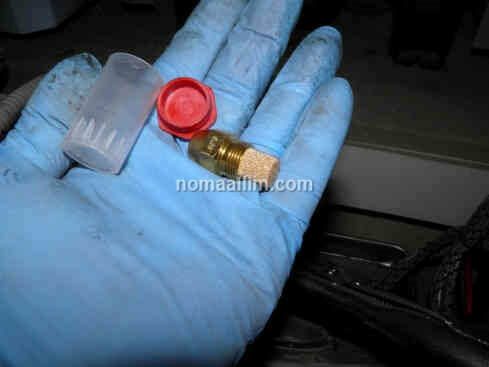 The nozzle (jet) can now be easily replaced. 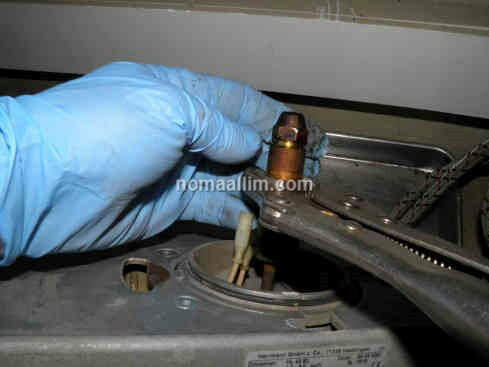 Fit a new nozzle (jet) of the same flow and reassemble the air guide to the burner head. Refit the electrodes after making sure of their condition. 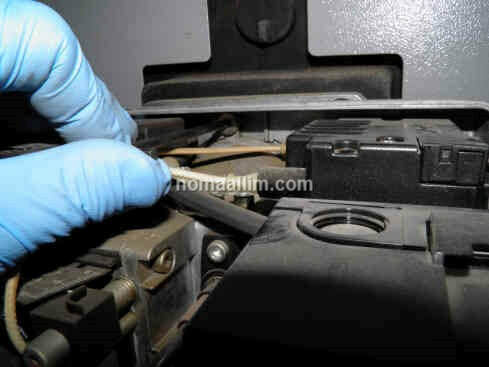 See our specific page for burner servicing and electrode gap adjustment. 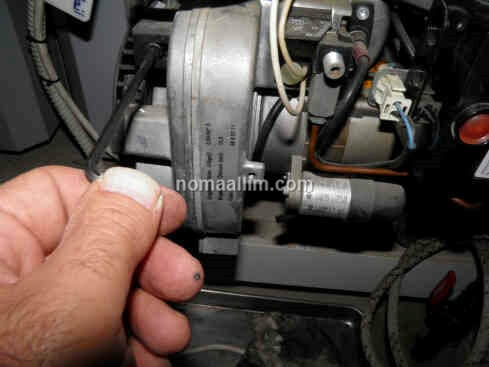 You should only adjust the air flow. 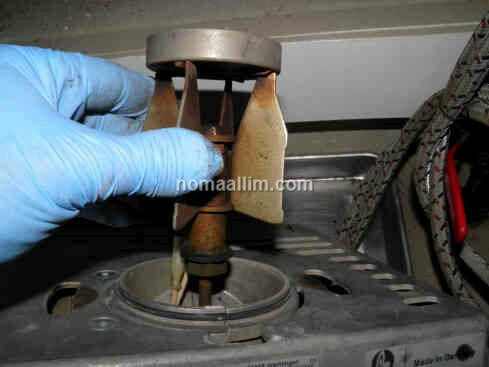 The oil flow is set by the nozzle rating and the oil pump pressure and should not be changed. 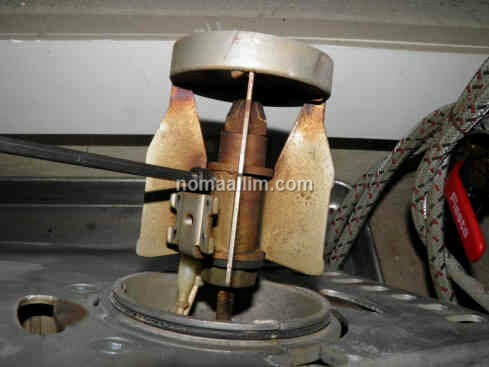 Use the sight glass to check the flame; increase air quantity if the flame is too red, decrease it the flame is too small. 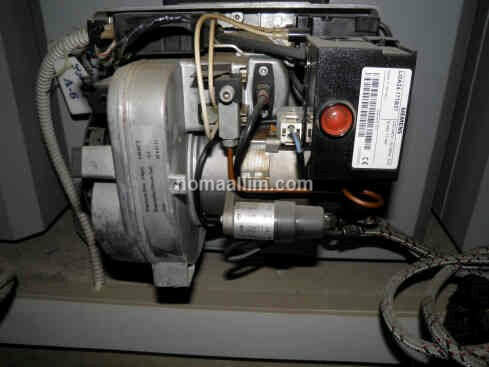 Do not forget to make sure your circulation pump rotates freely. 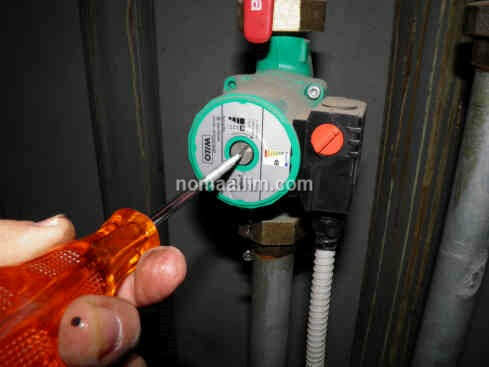 Take out its central plug and use a screwdriver to rotate its motor both ways to make sure it is free to move.